A few weeks ago, we shared news that Western Union is considering the sale of Western Union Business Solutions (WUBS). 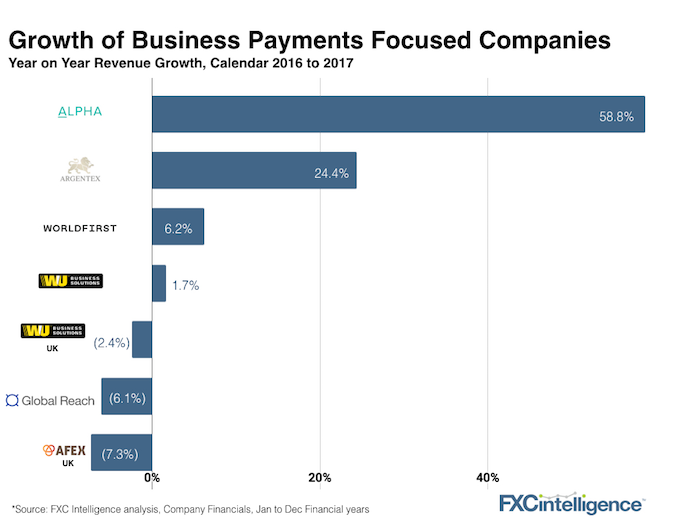 The news, along with a slew of UK companies reporting their 2017 financials, prompted us to take a closer look at the other companies in the space that are primarily focusing on international payments for businesses. The results were a little surprising. Whilst WUBS saw only marginal growth between 2016 and 2017, it actually outperformed a number of other UK companies even though its own UK division did slightly decline. Alpha, a current darling of the AIM stock market reported the fastest growth (albeit from a relatively small base) and WorldFirst stands alone with the highest operating margin of the group at 36%. There are of course a few notable absentees from this list. Ebury has been growing at a frantic pace but has not reported its 2017 numbers yet and US based companies like Flywire do not report detailed financials. TransferWise’s business arm has been performing well too, but there is no breakout, as of yet. What does this mean for WUBS and the other players in the space? What might be next for WUBS? WUBS is not currently a growth story, it’s public numbers tell us that. That instantly makes it a harder opportunity to take on for any group who is currently telling their investors a growth story. Although Western Union provides little segment guidance publicly, Hikmet Ersek, Western Union’s CEO shared a little more colour on the division at a payments event I attended last week: The payments part of the business has been good, but the trading and hedging segment has been challenging. Hikmet Ersek, CEO, Western Union Where could WUBS fit? Private Equity is one safe bet for a future owner although it’s unclear that one of the current investors in the space would take the plunge due to where they are in their investment cycles. That leaves a newcomer to enter the space which will require a lot more education. If a corporate is to make a play, a more general payments or financial services company may bite. Fleetcor acquired Cambridge Global Payments in 2017 and that acquisition helped expand Fleetcor’s business offerings, but it was not one a lot of people saw coming. Speculation any broader than that – let’s wait and see for now. Want to know more about Western Union Business Solutions. Get in touch.